Hmm writing in a ‘shed’ with no wi-fi distractions may be the key to being more productive. Tracey, do share more about your day. 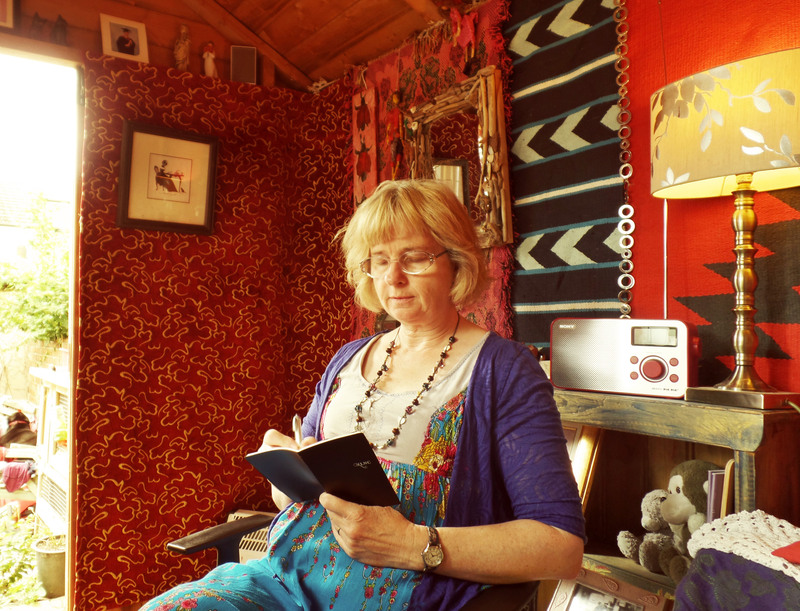 For a good deal of my writing life (which began full-time in 2010) my office has been a shed in the garden. As it happens I’m currently packing up my shed in preparation for a house move so I’m having to work in the house. I find this distracting, due to my two captivating rescue dogs wanting my attention so much of the time. I also have other intrusive business going on at the moment, mostly stemming from the house sale. At our new home in Hull I’ve created a cosy ‘shed’ by dividing an alcove off from the main part of the spare room. I hope I feel secure and isolated (in a good way) in there in the same way as I do going out to a dedicated space in the garden. But let’s imagine for now that I`m still working in my shed – it’d be a shame not to show you around. My mini-palace is no ordinary garden shed. 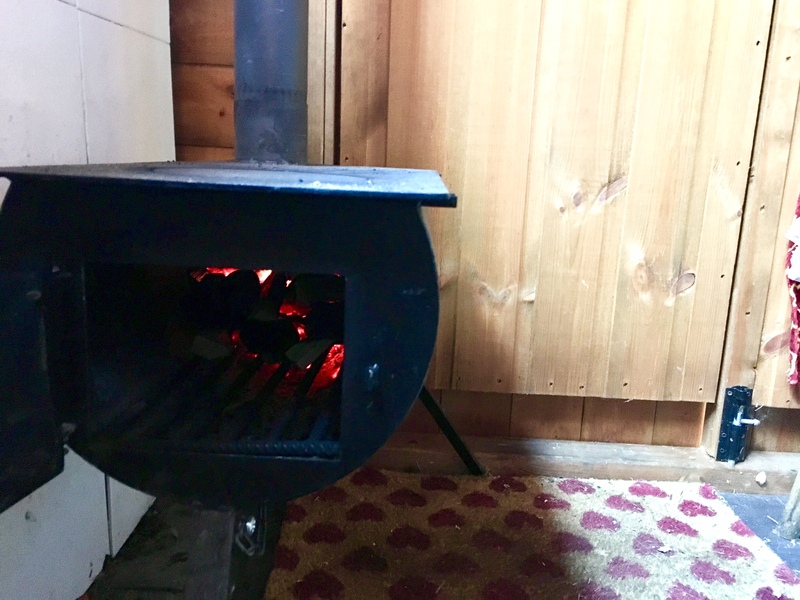 I have electricity and a wood stove and rugs hanging in there. I have photos of my kids on the bookshelves and one or two of my old paintings on the walls, too. Research notes and reference photos are also pinned up under the window, along with a calendar on which I mark the daily progress of my writing. In winter I have the stove burning merrily with the copper kettle coming to the boil on its flat top. My day begins with a catch up on social media before I exit my bed. The first task downstairs will be to provide `strokey time` for the dogs, who act like they haven’t seen me for a year. Then I need to give Luna her Turmeric paste, followed by her YuMove tablets and her anti-inflammatory medicine. She’s less than 2 years old but she has severe hip dysplasia. I`ll probably need to wipe down the kitchen after my 18-year-old daughter has blasted through it. She’s my youngest of four and about to leave home as her brothers have already done, so I’m much more indulgent with her than I was with the others! I try to leave any other housework tasks until outside of work hours but sometimes it’s difficult to ignore them. If I’m working on a new novel – which I am at the moment, only my progress has been interrupted by all this house moving business – I set myself a word-count target of 2,000 – 3,000 per day. I divide the target into more-or-less equal portions so that I know what I need to achieve in each session and I must reach the targets before I allow myself to take a break. (Even if I’m writing absolute drivel. Absolute drivel can be improved later.) I can also work out roughly how long it’ll take me to complete the first draft of a novel by sticking to the daily target. My novels are usually around 80,000 words long. Not that I won’t end up getting rid of at least one-third of it during the second draft but at least it’s a reason to keep going at the outset. Spending two years working as a secondary school teacher really helped me with targeting and time-management. During my breaks I return to the house, check on the dogs and generally move around a bit. Quite possibly I’ll be forced to pick up a snowstorm of stuffing from the latest cushion or soft toy disembowelment! I have a cup of tea and/or my lunch. On a sunny day I leave the back door open so the dogs can come and go in and out the house all day. I might have my shed door open while I’m working as well. I often prepare the evening meal early in the day, during one of my breaks. Back in the shed for another thousand-word session I feel refreshed, as though I’m beginning a new working day. If it’s going to get dark early I might take the dogs for their walk during my afternoon break, but at the moment while it’s light until nine I tend to take them out after work. A daily walk (two in the winter when it’s no fun for my husband to take them out in the pitch-dark early morning) is essential to me both physically and mentally. I’m lucky in that I live near a riverbank, a large, wooded park and a hilly common so I have plenty of opportunity to commune with nature. I’ll need to walk further to commune once I’ve moved permanently into our house in Hull. My walk talks a minimum of half an hour. An advantage of working in the shed is the lack of Broadband because if I’m really good and leave my phone in the house I get a lot more writing done. My husband comes home about six and that’s also my official work-finishing time. If I’m tantalisingly close to my target but not quite there I take a little extra time in my shed. He’ll most likely offer to take the dogs out for me if I haven’t done it yet – but that’s not really as good a thing as it sounds as I won’t then get the exercise I so badly need… but sometimes you can’t fit in everything! 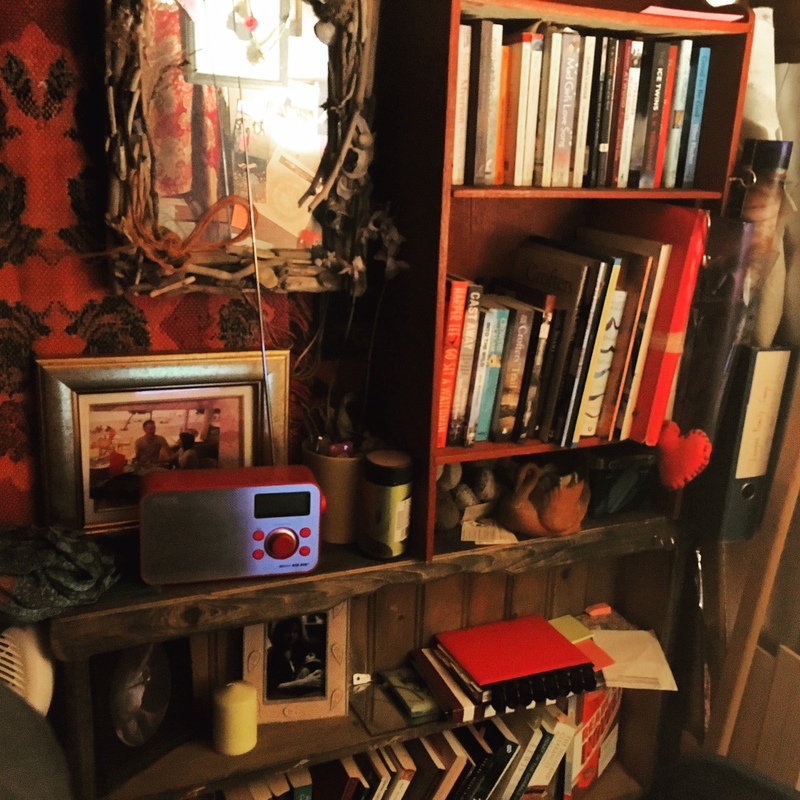 I much prefer working in my shed to being in the house because once I’ve typed the daily word-count I close the laptop and zip it into its bag. Then I lock the shed door after me and return to other business. Having the shed makes writing so much more like actually going out to work. I’m never distracted by housework in my shed. I tend to spend the whole time that I’m preparing, cooking and serving the evening meal talking about my characters and their fictional world while Phil listens patiently. Or possibly he’s not listening at all. When I was writing my first novel, The Last Time We Saw Marion, I used to read a chapter to him every night in bed. I soon realised he was falling asleep a few pages in. Pity I didn’t try that on my children when they were little! After dinner I like to make sure I’m up to date with email correspondence and then have another catch-up on social media. I like to watch a drama programme in the evening so if there’s nothing on TV I select something from catch-up or Netflix. I’ve recently watched complete series’ of Raised by Wolves, based on the childhood of Caitlin Moran, Peaky Blinders, which I was introduced to by my son and I’m now working my way through Orange is the New Black. Thanks so much Tracey for sharing your day. We have the same taste in TV! You can find Tracey’s blog here and buy her books on Amazon here. Posted on December 18, 2017 by Fabricating Fiction/Louise Jensen	• This entry was posted in A day in the life of..., Author chats and tagged author, books, novel writing, publishing, reading, writing. Bookmark the permalink. Thanks for taking part Tracey.